Recent research has found that the surface you walk on can actually help your health. It’s well-known that older adults may be able to lower stress, improve balance, and even lower blood pressure simply by walking. But, until recently, little attention has been paid to what people are walking on. One recent study suggests that walking on a cobblestone has health benefits not found when walking on a flat surface. Researchers at the Oregon Research Institute uncovered this health secret among adults over 60. Those who walk on cobblestone surfaces can get huge reductions in blood pressure, as well as overall improvement in balance and physical performance. Cobblestone paths are common throughout China. Traditional Chinese doctors actually instruct patients with a variety of health issues to walk on cobblestone. This is rooted in the ancient belief in reflexology. The uneven surfaces of the cobblestones stimulate the soles of the feet and even help strengthen organs, which are linked to “acupoints” on the soles of the feet. Before this new study arrived, there was no firm proof that cobblestones could benefit the body in specific ways. However, there have been lots of theories on what it works for—particularly for pain relief, insomnia, cognitive performance, and improved physical well-being. The U.S. researchers became interested in this when they visited China, and saw that adults were spending a half-hour every day on the cobblestone paths in parks and gardens, and beside riverbanks. So, they took the notion home, and looked into it. Study participants either walked on specially made cobblestone mats or walked on normal pavement, for one hour, three days a week. Four months later, the researchers found dramatic improvements in balance, physical function, and blood pressure among the cobblestone group. Those results are encouraging in helping prevent and delay the onset of frailty among older adults, as well as helping them maintain a strong circulatory system and healthy blood pressure levels. There was no indication as to why the walking reduced blood pressure. 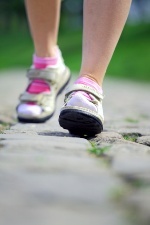 In any event, cobblestone walking is now a therapeutic and health-boosting activity. You might have to search for some surfaces to walk on, but the great news about cobblestone has already ignited a collective entrepreneurial spirit. Cobblestone mats that you can put in your home are now available if you know where to look. Your best bet is to start with Google. Li, F., et al., “Improving physical function and blood pressure in older adults through cobblestone mat walking: a randomized trial,” J Am Geriatr Soc. August 2005; 53(8): 1,305-12.